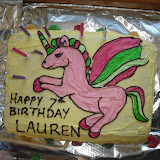 Lauren turned 7 on the weekend and had her 5 girlfriends over for a party! The girls went to Crumbles Pottery Studio to do some pottery painting. We rented a room in the studio and had a tutor come to show the kids how to paint the pottery. The pottery will be fired and glazed and eventually returned to the kids, so they have a memory of the party for the future. The kids could choose which pottery to paint, and had a selection of dinosaurs, heart-shaped trinket boxes, plates, mugs and cupcakes. The pottery turned out really well, and the girls were thrilled with the results. Afterwards, the girls came back to our house for food, cake and ice-cream.